1.) OAP's. Don't get me wrong, I respect them, and thank them for everything they did for us during World War II - BUT STOP BEING SO MISERABLE!! I mean, all they ever do is moan and complain. I get it from Michelle's grand-parents. Is that what I've got to look forward to when I turn old and grey? 2.) Our next door neighbour. 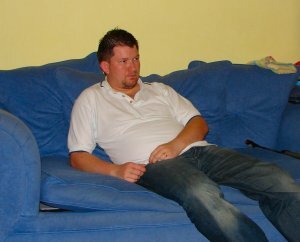 The bloke lives alone, doesnt work, and yet thinks its a great idea to do all his DIY, cut the lawn, bang and smash during the night. I mean, he doesnt do anything during the day, yet keeps me, Kieran and Michelle up during the night with the constant noise, and his drugged up friends knocking and banging on his door in the middle of the night. 3.) Foreigners. I'm not racist, and I'm not against everyone from other countries - just those who come over to England, can't talk a word of English, scrounge of our government, get given a nice 3 / 4 bedroom house. Evesham is full of Polish and people from various nationalities. Now, most of them work admittingly, but none of them speak a single word of English. Now, if I was going to live in a different country, I WOULD MAKE SURE I COULD SPEAK THE LOCAL LANGUAGE.... even if it was just a little bit. 4.) Cars with massive exhausts. I MEAN WHATS THE POINT??? We've got a prat who lives a couple of doors away (strangely enough, he is foreign!!) who has a bloody car with an exhaust pipe that looks more like some rocket boost port or something. Every night at around 10.30 he revs it up outsude, making such a noise, and reverses onto OUR driveway so that he can turn around. Now, with the sound of the stones and gravel on our driveway, along with the revving noise of his car, it keeps me and Michelle awake, whether we have the bedroom window or not. Anyway, thats enough from me for the moment. Rant over. I'm off now to finish getting ready for work. "The end is extremely f**king nigh"
Now, everyone who knows me knows that I LOVE zombie movies, or any other movie for that matter that centres around an apocolyptic vision of the past, present or future. Call me sad, but I just find the whole idea of a world in chaos due to flesh eating, ravaging undead corpses (or in the case of 28 Days Later, a rage infected populace) fascinating. I mean, how cool would it be to live in Raccoon City (Resident Evil), armed with a shotgun with an unlimited supply of ammo, shooting the crap out of hordes of murderous, hungry undead creatures!! BRING IT ON!!! Remember the old text adventures of old? I've written a couple of those games centering around this very thing - a group of survivors in England struggling to live and cope while the recently dead continue to rise and rampage the surburban streets of the UK. I think thats why I enjoy 28 Days Later so much - its the only true zombie movie (OK OK..... I KNOW, they aren't really zombies) set in our country and its great to see familiar landmarks in such an 'end of the world' kind of way. The street is deserted. You continue to walk along Tottenham Court Road, cars left resting in the roads with their doors wide open. Litter lay spewed all over the place. The eiree silence is disturbing. West : An entrance to Tottenham Court Road Undergound Station. The gate appears closed closed. East : Back the way you came along Tottenham Court Road. North : Entrance to a large music store. Sorry for the lack of updates. To be honest, not much has been happening here in Evesham lately, and things have been rather quiet. I think he kind of understands.... and he laughs.... no doubt wondering why Daddy is holding one of his toys and making strange vvrrrrmmmmm noises. Actually I do have something to be happy about. My "Not Another Comic Bakery Remix" is still being watched by quite a few people and doing reasonably well on youtube.com. I have even had two nice people leave positive comments. Oh, and it has been 'favorited' twice!!!! 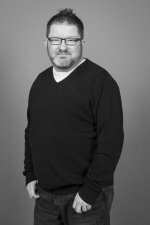 Oh, and after recently revamping the look of my blog, I think I might give my website over at www.stu-wilson.com a complete and radical face-lift as well. I've been feeling a little low lately..... Not depressed or anything like that.. just a little sad. You know, working in a school I sometimes forget how old I am getting. Although I still have nearly four months to go before I reach 30, all my friends who I went to school with have either turned 30 already, or will be reaching that age in a few months time. Most of the new Year 9 pupils at Evesham High School where I work (those who have just moved up from Middle School to High School) were born in 1993 - the year I left school!!! It doesn't seem that long ago when I finished my last exam on Friday 25th June 1993, and walked out of the school gates for the last time, and here I am now, helping kids who were born just as I had finished education! Its not that I feel I'm getting old which is worrying me... What scares me the most is how fast time is flying past. I left school 13 years ago. 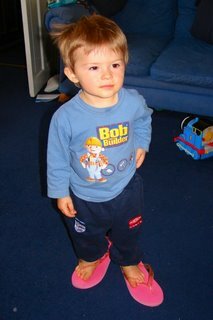 It's hard to believe that I have been with Michelle for nearly 5 years now, Kieran is 20 months old in 2 weeks time. Where is the time going? So much has happened in my life in the past 13 years since leaving school and it feels like my life is rushing by at an incredible rate. Working in a school reminds me of all the good times I had with my friends back when I was a student, and I think how lucky I am that most of us still stay in touch (even though I no longer live near them) and then I think about the really good friends I had who for one reason or another have no interest in staying in touch. What am I going on about? I have no idea. I'm not sure if I am making any sense writing this post, but I just wanted to write what is going through my mind at this very moment, and I guess thats the whole point of having a blog. Lately I've been feeling a little homesick too!!! Homesick???? 5 years after moving from home??? Do you know what cheers me up when I start talking and thinking like this??..... A bit of nostalgic retro gaming on my Commodore 64 to help cheer me up and remind me of the good ol' days, so I think thats what I am going to go and do now. Kieran dances to the Scissor Sisters..
Kieran loves the Scissor Sisters... Everytime we put the TV on, and "I Don't Feel Like Dancin' " comes on, he gets up and starts showing his dance floor moves (I can't say I blame him, I think it's a fantastic song). I recorded him earlier tonight on my mobile phone (I apologise for the awful sound quality), and wish to share the clip with you all. Just click on the picture above to start the streaming video. My favourite part is half way through the video where he looks like his clicking his fingers to the beat of the music..... you'll see what I mean! I've had reports that the video doesn't play on certain computers. I've tried it on a few PC's at work and at home and I've been getting a mixture of some that work and some that don't. I think that as long as you have the lastest version of Flash Player installed (9 I think), it should play ok. Shoot me if I'm wrong! 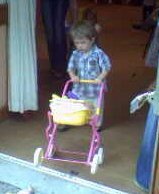 After last weeks post regarding Kieran wanting to always wear Michelle's shoes, this picture was taken at playgroup during the week.... Kieran pushing a pram!!!!!!! AND IT'S PINK!!!!!!!!!!!!! * Please note, I am only joking about being worried - its perfectly normal for little boys to play with prams and dolls (hey, I admit, I did it when I was little), just like it's normal for girls to play with toy cars, and stuff like that! Here I am again, with another song! First of all, you've all probably noticed that I have had a play with the design and layout of my blog - I hope you all like it. Actually, this song isn't entirely mine - whereas I prefer to write my music from scratch, this one was put together using the Digimpro software (very quickly may I add). I tend to stay well clear of these 'remix' programs where you simply drag loops and samples onto a grid to make the song (ala Dance Ejay) as I don't think there is one bit of creativeness in the finished songs, but what the hell!! Actually, after saving the finished song, I did run it through my music editing software and added a few of my own bits here and there in the song to make it a little more unique, so its a kind of collaboration effort! Anyway, I'm putting it online here because I liked the finished result so much. 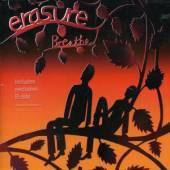 May I present to you - Erasure's Breathe - The Wilson Remix. After serious consideration (oh, and Dan telling me that I should do it), I've opted to go with Blogger Beta. So far the switch over has been a success, (if you are looking at this, then it works!) and it doesn't look like I've lost anything. I'll see how stable this one is, and if I don't experience any problems with it, then I might just stick to it rather than code my own blog. 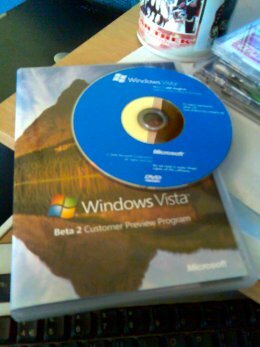 Speaking of betas, I've managed to get the latest Beta build of Windows Vista from a Microsoft Technet seminar (thanks Graham!). Do I risk installing it on my desktop or laptop? It comes on 2 DVD's (one for x86 systems and the other for 64bit systems). I did have a copy of an early build quite some time ago (shortly after it had renamed from Longhorn to Vista), but it wasn't that stable and made my laptop almost unusable. Uh oh... Looks like Blogger has messed up my blog - It seems that whenever someone visits the blog, it doesnt display properly and doesn't show the more recent posts. As I write this, I'm not sure if this test post will work, but if it doesn't I think I'm going to ditch Blogger and just create my own blog from scratch on my webspace - at least it'll be more reliable! I just popped onto www.youtube.com and noticed that my music video isn't doing THAT bad. It was uploaded just under 2 weeks ago, and so far I have had 173 views (no they are not all from me), 3 ratings and a grand total of 4 out of 5 stars. I've been a keen amateur photographer for a few years now, and have quite a lot of my work available to view and rate on www.renderosity.com. I did have an online gallery with Renderosity which was available in the links section to the right of this blog, but for some reason Renderosity have changed their website, and I can't link directly to the gallery unless you (the visitor) are a member. Soooo.... I've put together another gallery - this time in my own web-space. It has a few pictures (including some not available on Renderosity and even my own website (www.stu-wilson.com). I hope you all have a little look - don't expect anything too professional, but I like them, and want to share them with you all. I'm sat here, quietly listening to the soundtrack to Conan The Barbarian (you've got to love Basil Poldouris's music) when all of a sudden, Kieran comes up to me wanting my attention. Nothing strange about that, except that he is wearing mummy's flip-flops!!! I guess its normal for little kids to try on their parents shoes, but recently he has been putting on Michelle's shoes alot, BUT NEVER bothers to try my shoes on - is he trying to tell me something? Should I start worrying? Will it be long before he starts asking for stilletos with a 6 inch heel or something? Just a quick post regarding Star Trek, which is 40 years old today!!! Yep, on the 8th September 1966, history was made, and Star Trek beamed onto American television screens for the first time. Now, 40 years later, even with the cancellation of the latest spin-off series "Enterprise" in 2005, the show is still as popular as ever with an 11th movie planned for 2007 (current rumour is that the director of the Tom Cruise blockbuster Mission Impossible III will be taking the helm, directing the movie) AND not only that, but recently CBS/Paramount TV have announced that all 79 episodes of the original series will be re-mastered with brand new state-of-the-art CGI visual effects and new soundtracks!!! WOW!!! Thats enough to make even Mr Spock wet himself!! 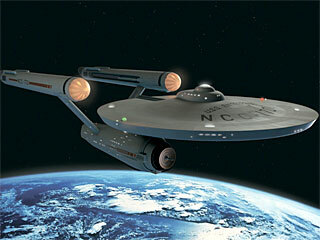 Anyway, Happy Birthday Star Trek, and heres to the next 40 years! When will I... Will I be famous? I've decided to upload my Comic Bakery music video onto YouTube. Hope that was a good idea - now the whole world can judge on how good/bad my remix is!!! Just a quick post, mainly for Dan and Jodie actually. Here is hard evidence that I DON'T ALWAYS wear my coat indoors... No - the photo hasn't been edited in Photoshop - IT REALLY IS ME WITHOUT A COAT ON INDOORS!! I got Michelle to take this picture as Proof! For anyone who reads my blog who might not understand, its been a long going joke about me going round to see Dan and his family (or anyone else for that matter), and not taking my coat off, even if its really hot. Dan mentioned that I had my coat on in the music video I made for my Comic Bakery Remix. The reason I did was because I filmed extra scenes which didn't make it into the final cut showing me getting ready to take Kieran (my son) out for a walk. It showed me looking at the clock, noticing that I had enough time to fire up the C64 and having a quick play on it. Of course, a quick play turned into a long play and Kieran started to get impatient. Thats when you see him picking up the remote control and turning over to watch Bob The Builder after I get zapped into the TV. SEE!!!!! There is a reason! I don't actually make a habit of playing on my computer indoors in hot weather with my leather jacket on!